Significant advances in mobile technologies, network coverage and internet access have opened up great possibilities to improve patient-centered care and public health. KNCV Tuberculosis Foundation (KNCV) strongly believes in the positive impact digital health solution can bring. Take the example of QuanTB: an electronic forecasting, quantification, and early warning system designed to improve procurement processes, ordering, and planning for TB drugs. A tool that is especially useful now that newly World Health Organization recommended TB medicines and treatment regimen pose challenges to the national TB programs during introduction and scale-up. KNCV’s ‘Strengthening Country MDR-TB Drug Management and Quantification Project’, funded by Eli Lily, helps to improve quantification of TB medicines using QuanTB, which, when it’s used on a regular basis, serves as an early warning system, providing information on actual versus planned consumption, impending expiries, and stock-outs of medicines. The project aims to strengthen countries’ ability to manage and forecast MDR-TB drugs usage to ensure an uninterrupted supply of second line drugs and treatment for MDR-TB patients, and to contribute to a global forecast. In the supported countries, Kazakhstan, Kyrgyzstan, Belarus, Armenia, Azerbaijan, Vietnam, Rwanda, Botswana and Somaliland, KNCV has worked mostly through regional and local focal persons in the anticipated countries. Each of the countries do face their own unique situation, requiring tailored work plans. The first missions to assess the current quantification system and processes took place in October, 2015. Since then all countries have moved beyond initial assessments into conducting regional and national training sessions for NTP staff and relevant national stakeholders (e.g. pharmacists) and providing technical assistance. Before implementation of QuanTB, storage managers in Rwanda would use simple excel sheets to monitor their stock. Putting the tool in place has allowed Eli Lilly and KNCV Tuberculosis Foundation to help ensure that medicines are available to the people who need them, and valuable drugs do not expire needlessly. 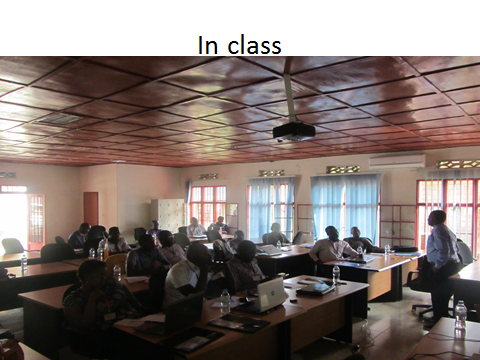 Training professionals in Rwanda, Botswana and Somalia has proven to be a great success, even extending to professionals from other countries outside the scope of the project, such as Malawi, who have also enthusiastically participated in training. The practical impact of the digital health implementation was felt soon after. In Rwanda, clinicians had long urged the NTP and the ministry of health to transition to a more modern pediatric regimen. However, the ministry was reluctant as pediatric regimens are notoriously difficult to phase in and out. But because of the use of QuanTB, a reliable overview of current stock was produced, revealing the costs incurred by phasing out the current pediatric regimen. This overview allowed key decision makers in the NTP and the ministry of health to weigh the cost and benefits and accept clinicians’ recommendation to transition to a more modern pediatric regimen.